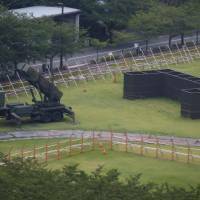 The government has decided to deploy Patriot interceptor missiles in parts of western Japan that North Korea’s missiles are expected to fly over if Pyongyang actually goes through with its plan to fire them at Guam, Defense Ministry officials said Friday. The move was prompted by North Korea’s announcement Thursday that it was “seriously examining” a plan to simultaneously test-fire four intermediate-range ballistic missiles over western Japan in an “enveloping strike at Guam,” a popular Pacific resort island and U.S. territory. The government hoped to complete the deployment of the surface-to-air missile defense system by Saturday morning. 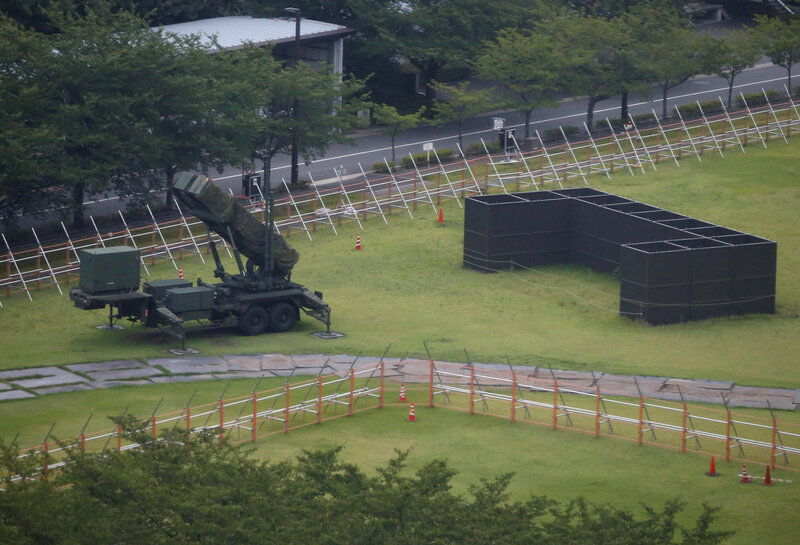 The Air Self-Defense Force was likely deploy the Patriot Advanced Capability-3 system in Shimane, Hiroshima and Kochi prefectures, which North Korea said the missiles might cross over, as well as Ehime, the officials said. The North said the warning shots would be configured to miss Guam by 30 to 40 km. The Japanese government wants to be ready in case the North’s missiles malfunction while over Japan. The SDF does not regularly station PAC-3 teams in those prefectures. Japan is protected by a two-stage missile defense shield. The first stage is based on ship-launched Standard Missile-3 (or SM-3) interceptors. The second stage involves the ground-based Patriot missiles, developed by Raytheon. In 2016, Japan deployed PAC-3 batteries to the islands of Miyako and Ishigaki in Okinawa Prefecture before North Korea launched what it claimed was a satellite. On Thursday, Defense Minister Itsunori Onodera told reporters he would consider deploying more PAC-3 batteries after examining various aspects of the North Korea situation. The government has been alarmed by the escalating rhetoric of U.S. President Donald Trump and North Korea as the hermit state continues to provoke Washington, Tokyo and the United Nations with its steadily advancing nuclear weapons and missile programs. Tokyo will discuss with Washington how best to deal with the crisis while strengthening surveillance activities, informed sources said. “We are on full alert and well-prepared to respond to any contingency situations,” Chief Cabinet Secretary Yoshihide Suga told a news conference Thursday. “We hope to strengthen the deterrent power of the Japan-U.S. alliance and response capabilities,” he added, referring to the upcoming meeting of the allies’ foreign and defense ministers in Washington on Aug. 17. North Korea continues to issue provocations despite a U.N. Security Council resolution adopted Saturday to strengthen sanctions against it for testing two intercontinental ballistic missiles last month. “Trump would probably take military action if North Korea attacks Guam, but would probably not if North Korean missiles fall around the island,” a Japanese government source said. If the situation worsens, Japan could be targeted by North Korea in retaliation. Tokyo therefore hopes that the Trump administration will not take any military action. Still, Japan is finding it difficult to strongly oppose Washington, which is increasingly worried about North Korea’s ICBM advances, because Tokyo relies heavily on Washington for protection, pundits said. At a Diet committee meeting Thursday, Defense Minister Itsunori Onodera suggested that launching missiles toward areas near Guam may meet the conditions for Japan to exercise its newly justified right to collective self-defense, or coming to the aid of an ally under armed attack even when Japan itself is not under attack. At the upcoming two-plus-two meeting, Japan and the United States are expected to discuss ways to strengthen missile defense capabilities and promote joint military exercises between the Self-Defense Forces and the U.S. military. U.S. Secretary of State Rex Tillerson recently said the U.S. was ready to hold dialogue with North Korea if the reclusive state puts an end to its provocations. At the meeting, Tokyo hopes to coordinate views with Washington on ways to respond to North Korea, including a military option, sources said.